Massive well done and farewell to Mike this week. Last week was his last week of training, as he is moving to the sun-kissed (wink, wink) city of London. 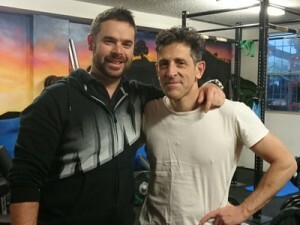 Mike started training with me in mid January, with goals to strengthen his back and add some muscle. When he started he had a posture similar to Mr.Burns from the Simpsons, with the strength levels to match. We tested his strength on the deadlift in January. He was not able to lift more than 40kg without getting back pain. After 4 months, he added 3.5kg of muscle and here he is deadlifting 120kg with ease. (I still contest he could have lifted 140kg if we had the time for 2 more attempts).